2. The Voltage Mode (IEPE) System. Charge Mode sensors are usually manufactured with either ceramic, eg. Lead Zirconium Titanate (PZT) or quartz piezoelectric elements. These sensors can be used with a Charge Amplifier, which is a special type of amplifier designed specifically to measure electrical charge. The charge mode system is thus composed of the charge mode sensor, the charge amplifier, and the interconnecting cable. The input stage of the charge amplifier utilises a capacitive feedback circuit to balance or “null” the effect of the applied input charge signal. The feedback signal is then a measure of input charge. 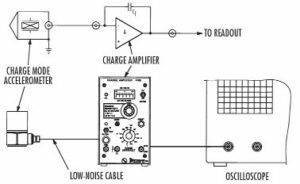 Alternatively, there are in-line charge amplifiers now available which serve to condition the high impedance pC output from the sensor, to give a low impedance voltage from the amplifier, which is equivalent to a standard IEPE system. In this case the system sensitivity (mV/unit) is simply derived from the calibrated pC/unit output of the sensor, multiplied by the mV/pC output of the amplifier. Due to the very high input impedance of the charge amplifier, the sensor must be connected to the amplifier input with low-noise coaxial cable, which is specially treated to minimise triboelectric noise, e.g., noise generated within the cable due to physical movement of the cable. Since there are no electronic components contained within the sensor housing, the upper temperature limit of charge mode sensors is much higher than the limit imposed by the internal electronics of IEPE sensors. The high temperature limit is set by the Curie temperature of the piezoelectric material or by the properties of insulating materials employed in the specific design. A miniature IC metal oxide silicon field effect transistor amplifier built into the housing of the Voltage Mode sensor, converts the high impedance signal from the quartz or ceramic element to a much lower output impedance level, so the readout instrument and cable length (does not need to be low noise), have little effect on the signal quality. Because the high impedance input to the IC amplifier is totally enclosed and thus shielded by the metal housing, the voltage mode sensor is relatively impervious to external electrostatic interference and other disturbances. The sensitivity of the voltage mode sensor is fixed at time of manufacture by varying the total capacitance across the crystal element, and cannot be changed. External amplification performed in power units, or by other means can amplify or attenuate the signal but cannot change the fixed sensitivity (mV/g, mV/psi or mV/lbf) of the sensor. The Voltage Mode sensor does not require a charge amplifier, but rather a much simpler Current Source Power Unit. The power unit contains a DC power source (batteries or a regulated DC power supply), a current source element (constant current diode or constant current circuit), and a means of blocking or otherwise eliminating the DC bias voltage that exists at the centre terminal of the sensor connector, so the signal may be conveniently coupled to the readout instrument, which may already have a built-in IEPE supply. Apart from the temperature limitation of the built-in electronics, most applications can use an IEPE sensor. Please ask for advice if you are unsure about which is the most appropriate technology to use.